My legs and busting lungs screamed for a day off in Sary Tash (that’s what you get when you sit on a horse for a month). But the clear skies were too good to spend indoors. You never know when the winds will change and blow a dastardly-blizzardy-storm your way. The border was open. The Krygyz one. I didn’t make it to the Tajik one. I spent the night in no-man’s-land. Nothing between Sary Tash and Qarakol, several had said. 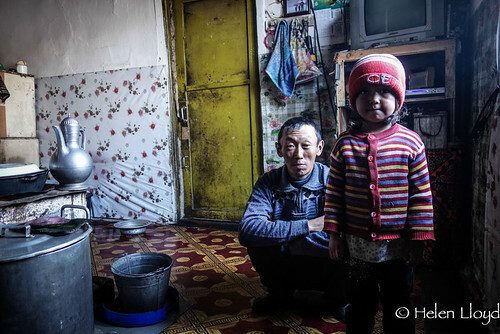 Nothing except a farmstead before the final switchbacks to the pass into Tajikistan with a nice man, head of the family, who said I could spend the night there, nice and cozy in the stove-warmed room. Too warm. I had to rush outside into the freezing 4,000m air just to get a few breaths of freshness during the deep dark starry night. Unfortunately, breakfast of tea and bread took the best part of 2 hours to prepare. I didn’t wait long enough to get any. 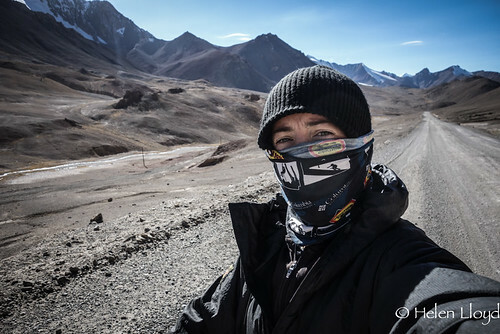 Instead, I pushed on up to the pass, gasping for air every few metres, on an empty stomach. 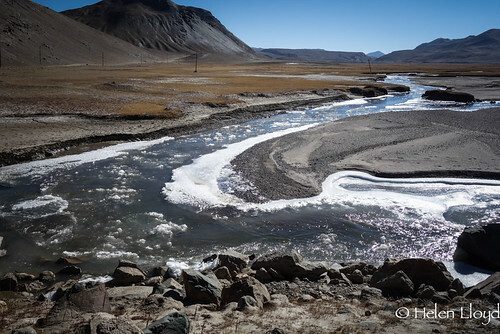 By the time I had free-wheeled down and reached the Tajik border post, my hands were frozen numb, my feet on the way too and my belly growling. Come in now, the officer ordered. I meekly followed, passport clenched in hand. Sit, drink chai, warm up, want eggs? He reeled without looking up from his papers. Ok, I said. So I got my breakfast eventually. Cooked and served by soldiers. Defrosted and belly full, I cycled on to Qarakol Lake. And decided to keep going to the next river and camp there. But that was when one of those killer headwinds blasted my plans away. 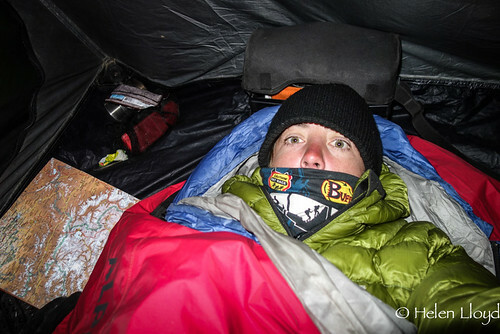 I pitched up in the shelter of the hills instead, with just a litre of water to see me through the night. Damn, I was thirsty. No coffee the next morning for warming and waking. Instead I packed up and pedalled towards the river. Those 15 kilometres were long. It was the first real cold day. Cold feet. Should stop, warm them up. But need water. Just get to the river and then can drink as much coffee as I like, and eat breakfast and defrost. OK, that’s better. 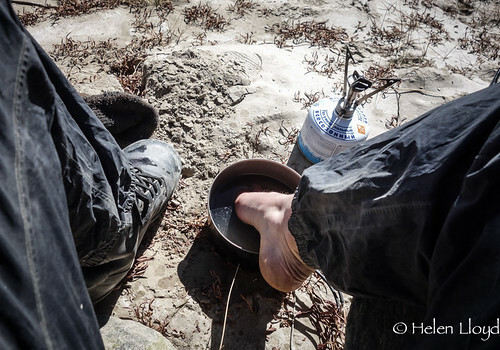 With socks and boots and, would you believe it, even trousers, I continued to the river. By then the sun was warm and I was well on the way to a sun-burned nose, although I didn’t know it then. 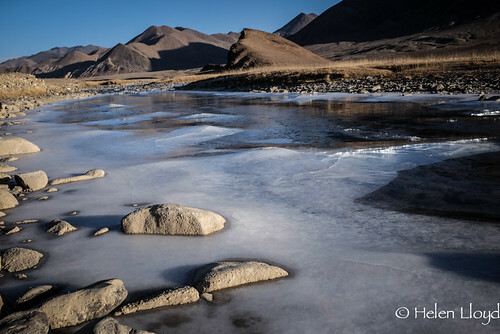 So I sat by the ice-lined river and watched the melting snow float by in clumps like a slush puppy. And I drank coffee and basked in the sun. Soon I was lovely and warm. Except my big toe. It was numb and white and, well, not quite right. But dunking it in a pan of warm water brought it back to life. From there, it was a gentle ride through the valley and then a final slog up to the Ak Baital Pass at 4655m – the highest I’ve cycled. And then it was a lovely long downhill to Murghab. 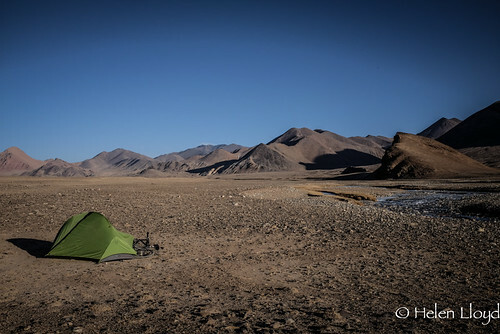 Camped just before, beside a river, frozen by morning, surrounded by red rocks of a desert landscape. It was an easy start the next day, because I’d slept in all my clothes and then cycled in them too. Murghab was a feast for the eyes after those few days with little but nature to look at. Reminded me of the Pueblos Blancos in Andalucia, bathed in sunlight. From a distance that is. Up close it was a ramshackle place, crumbling and charmless. But there was a hotel, and they served food, and I could buy more at the market – a bazaar built of old shipping containers, twin lines separated by rubble. 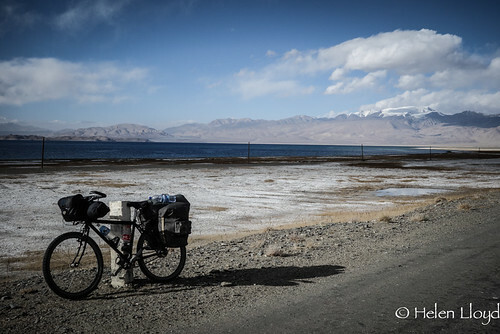 If you missed the pics of the ride from Osh up to Sary Tash, then here they are.